As soon as November 1st hits I feel like it’s acceptable to start getting excited for the winter holidays. Now that we own a home (I still pinch myself every day!) I count down the days when Blake pulls out the ladder to put up lights on our home. That also means I get to pull out all of my decorations for inside. 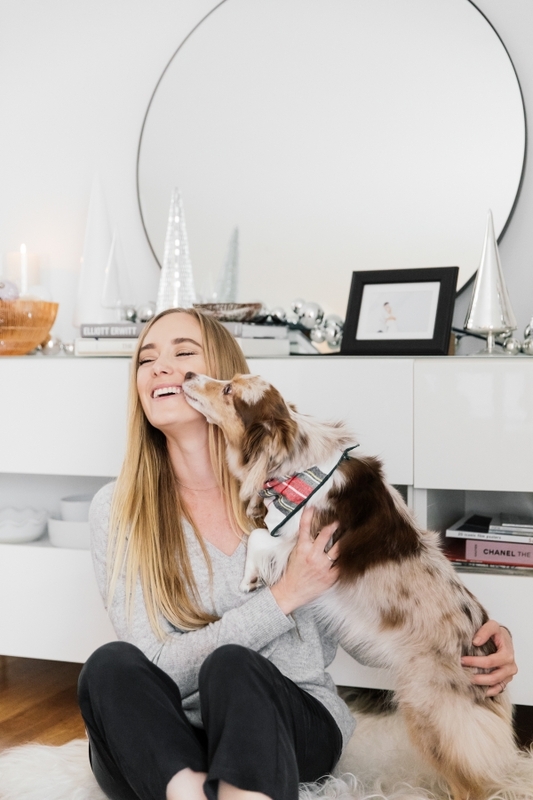 I am so excited to be partnering with one of my favorite home brands, CB2. 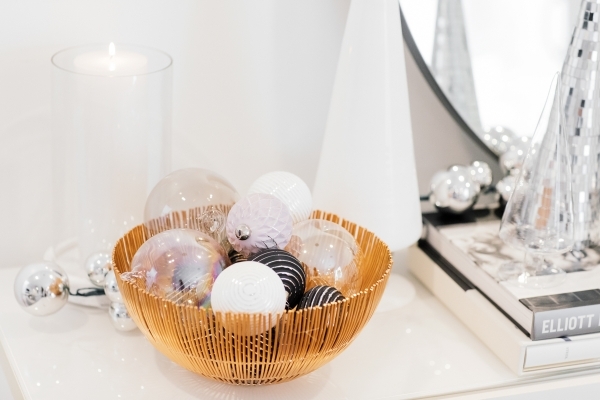 It’s always been a go-to for decor items. 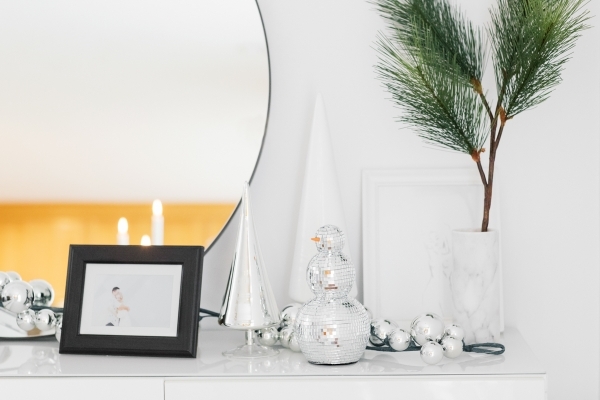 I probably own most of their marble pieces and always love to see what they have new in each holiday season. 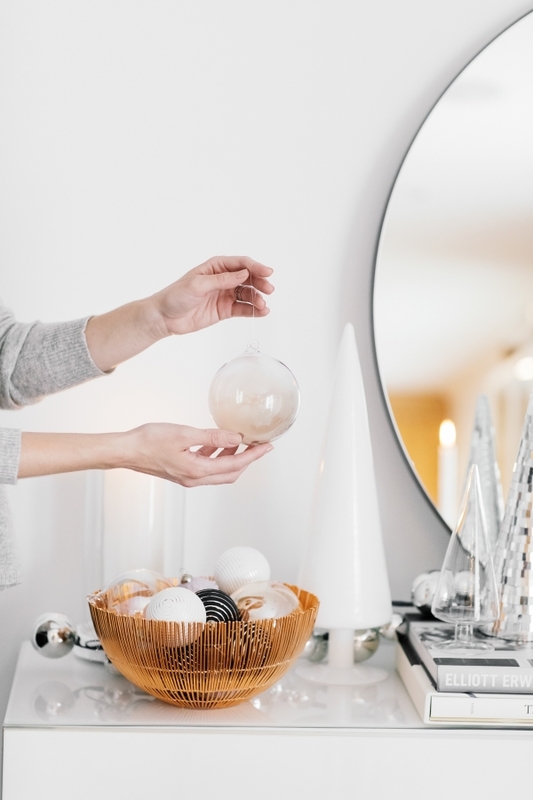 I decorate with modern vibes at home and that also means I want to put a modern twist on my holiday decorations throughout my home. This year, I put my focus on my credenza. 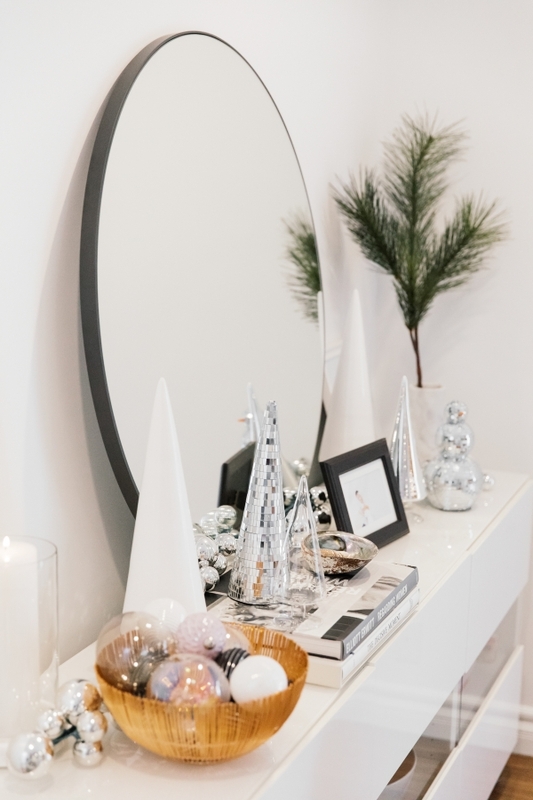 It’s a place where I have room to accessorize and I love to style with crisp whites and pops of metallics for an elevated holiday feel. 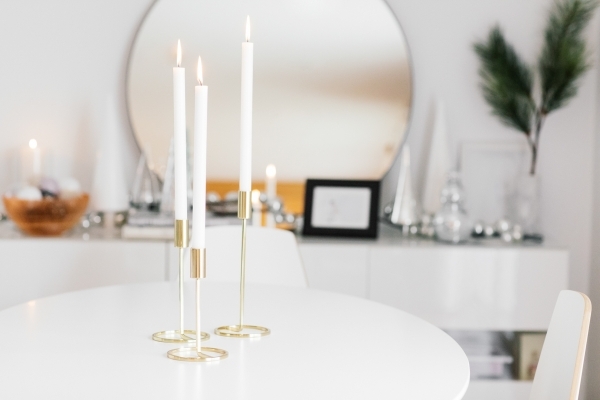 First off nothing screams holiday dinner parties and happy hours more than long white stemmed candles. I am so obsessed with these candle holders. 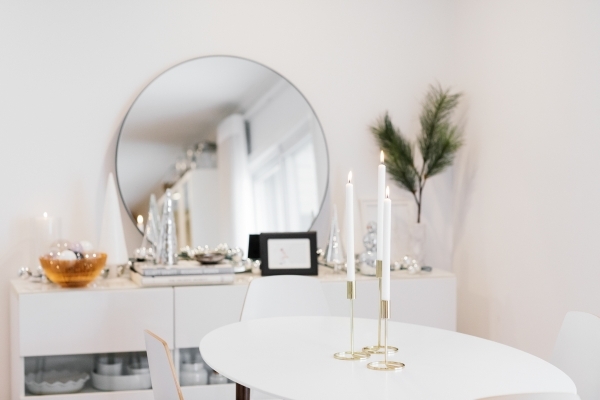 They add such a beautiful pop of gold to my white table. Other pieces I love are the abstract tree sculptures. 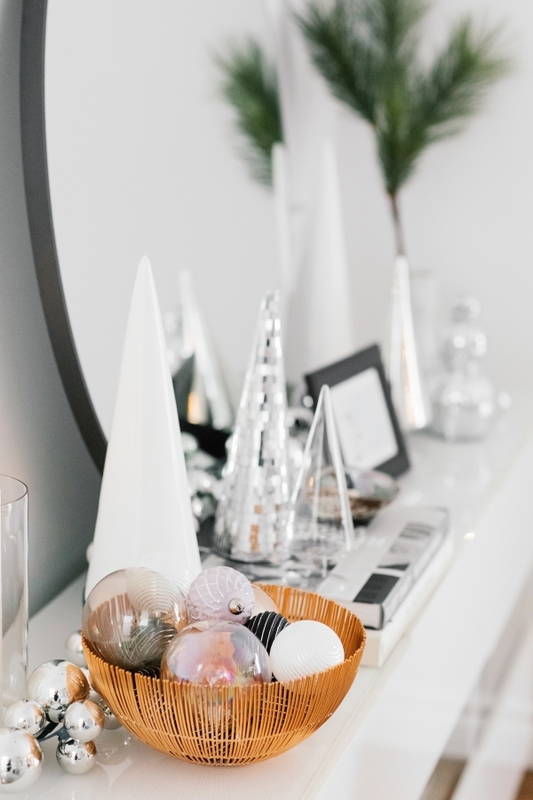 I love mixing and matching the white, clear and disco ball materials. And can we talk about this snowman??? It’s one of the most unique pieces and done so beautifully. It’s minimal but still makes a statement. Another stand out piece for me is the pine spray placed in the marble vase. I have some other faux plants around the house and while I love the real thing, cleaning up those needles are a pain especially when it’s on a credenza. Love the idea of still having these, but without the cleanup. Adds a nice pop of color to my white and metallic decor. I think what I love most about all the pieces I chose to style, is that they can all be easily restyled from year to year. Each time in a different way, different location. 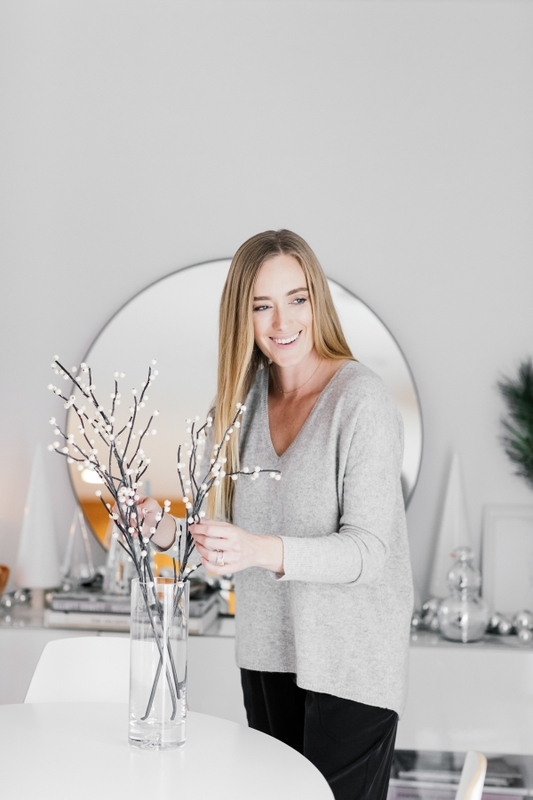 Since they blend seamlessly with my decor style, I can easily move them from room to room to sprinkle some holiday spirit throughout my home. So, for now I will be counting down the days to the New Year and blasting as much holiday music as I can. 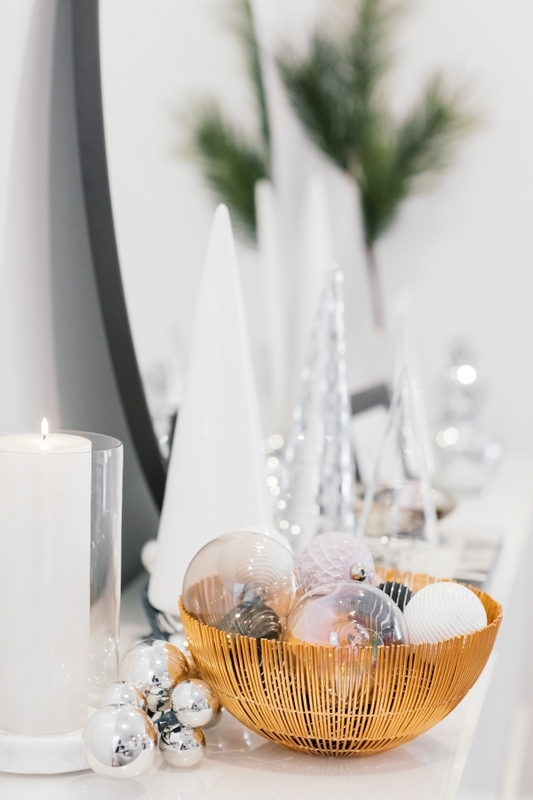 A big thank you to CB2 to letting me style some of your beautiful holiday pieces. This post is sponsored by CB2 Big thank you for supporting all eat/sleep/wear collabs. 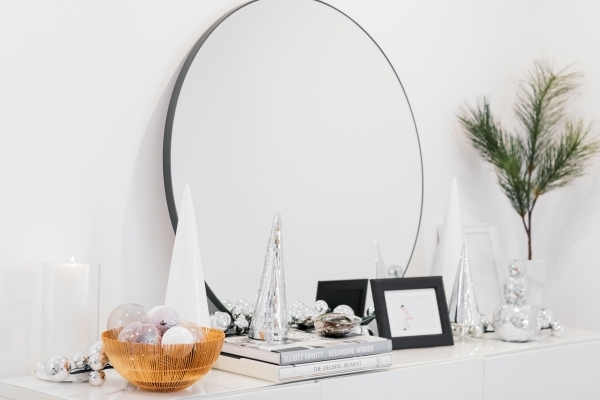 Charmaine Ng | Architecture & Lifestyle Blog - I’m with you – as soon as November hits, Christmas time! I love the home decor you did for the holidays in the photos. 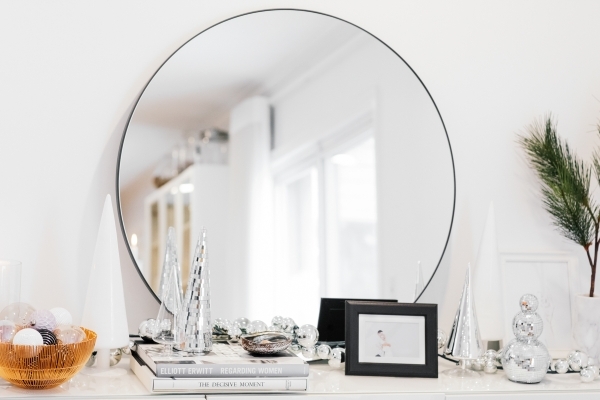 A white, clean palette is so classic! Rena - I see you are really already in a festive mood! Sharon - I knew this was CB2 stuff as soon as I looked at the first pic. I can spot CB@ stuff and West Elm from a mile away. I actually just got CB2’s new catalogue and it is unreal, like insanely beautiful. I bought this gold wreath that is on the first or second page if you see the catalogue you’ll know which one I’m talking about. Seppy - Oh goodness, obsessing over these pictures!!! I love that there’s a subtle touch of holiday spirit in there but it’s not overwhelming.